In a study of older people with no clinical diagnosis or signs of dementia when hospitalized to repair hip fractures, Johns Hopkins researchers say they found biomarkers of Alzheimer’s disease in most of the patients’ spinal fluid samples. The researchers say results of their study add to evidence that brain alterations that lead to poor balance in older people may underpin both increased risk of hip-fracturing falls and Alzheimer’s disease, and that hip fracture itself may therefore serve as a first sign of undiagnosed disease. Oh cautioned that her study does not suggest that every older person who has a hip fracture has Alzheimer’s, nor should everyone hospitalized for a hip fracture undergo spinal fluid tests for disease biomarkers at this time. But it does suggest that anyone facing hip repair surgery after a fall be monitored closely for signs of post-operative delirium or other mental or cognitive problems during recovery as some people may have underlying Alzheimer’s disease, which might make them more vulnerable. Oh also noted that physicians are now diagnosing Alzheimer’s disease much earlier, and many people live for decades after diagnosis. Although there are no cures or proven treatments, early detection and health care planning may improve coping strategies and extend independent living time. According to the National Institute on Aging, more than 5.5 million people¾most over the age of 65¾in the U.S. are estimated to have Alzheimer’s disease. A report on the findings was published in fall 2018 in PLOS ONE. 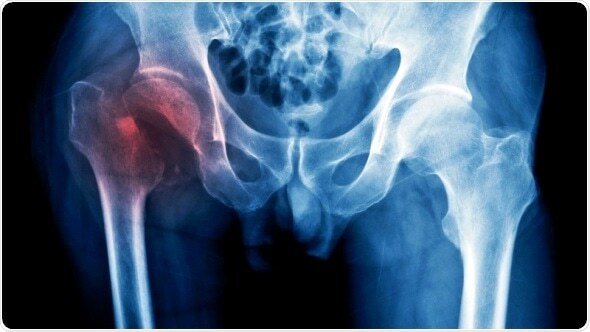 Oh noted that several international studies have shown that up to a quarter of older adults hospitalized for hip fracture surgery are likely to die within the following year, results suggesting that a serious medical condition may have been simmering undiagnosed prior to the falls that sent them to the hospital. Oh’s new study was in part a response to results of research published late 2018 in JAMA Surgery by Johns Hopkins researchers, which showed that 34 percent of hip fracture patients develop delirium during their hospital stay, a condition characterized by restlessness, delusions and incoherent thoughts and speech. Because patients with Alzheimer’s disease are more likely to experience these symptoms, and because of the higher than normal mortality rate associated with hip fracture compared with other surgeries, Oh and her team designed their study to directly test hip fracture patients for Alzheimer’s disease biomarkers. For the research, the Johns Hopkins team recruited 200 hip fracture patients admitted to The Johns Hopkins Hospital and Johns Hopkins Bayview Medical Center from November 2011 to May 2016. Participants were an average of 82 years old, ranging from 65 to 102. Most of the participants, 74 percent, were women. Some 96 percent were white. The study also only included hip fracture patients who had received spinal (local) anesthesia before surgery so that spinal fluid samples could be collected at the time of anesthetic injection. In 168 of the patients, the spinal fluid samples were tested for elevated levels of commonly accepted biomarkers of Alzheimer’s and other neurodegenerative diseases. The biomarkers included the proteins amyloid beta 42 (Aβ42), Aβ40, tau, and tau with a phosphate chemical group attached (p-tau). The amyloid proteins and tau are found in hallmark, tangled clumps in nerve cells, and in plaques that form in the brains of people with advanced Alzheimer’s. High levels of p-tau indicate brain injury or other types of brain cell damage. Before surgery, participants in the study also completed the Mini-Mental State Exam and the short form of the Informant Questionnaire on Cognitive Decline in the Elderly, standard tests designed to determine mental state, memory and cognition. On the basis of those test results, participants were given a Clinical Dementia Rating, with a score of 0 being completely healthy (representing 70 participants); 0.5 meaning mild cognitive symptoms (81 participants); a score of greater than 1.0 meaning early dementia (13 participants); and a score of 2.0 meaning moderate dementia (four participants). Of the people in the study, 86 percent had abnormal Aβ levels, 65 percent had abnormal tau and 35 percent had abnormal p-tau. When the researchers specifically looked at biomarker levels in the group with a Clinical Dementia Rating of 0, they found 62 out of 70 patients, or 88.6 percent, had abnormal levels of any one of the biomarkers. In the Clinical Dementia Rating group with a score of 0.5, indicating mild cognitive impairment, 98.8 percent or 80 out of 81 participants had abnormal levels in any one of the biomarkers. The researchers ruled out older age as a possible factor skewing their results; normally 23 to 32 percent of people between 65 and 74 years old have abnormal Aβ levels. However, in the hip fracture patients, 68 percent of people in this same age range with a Clinical Dementia Rating of 0 had abnormal levels of Aβ. Oh’s group plans to monitor study participants for a year after each surgery to document progression and clinical dementia ratings. Testing for Alzheimer’s disease biomarkers is not covered by Medicare and isn’t routinely performed on older adults. It can be done by an amyloid PET scan or by using biomarkers from spinal fluid, such as in this study. The PET scan test costs at least $3,000. The spinal fluid analysis is still mostly used for research, although it is commercially available in some laboratories.